I walked up my driveway today and ritually reached into my letterbox. Usually dulled to actually contemplating the usual array of advertising or other people’s mail, my eye was caught by the line ’AN IMPORTANT MESSAGE FOR YOUR FAMILY’ displayed on a pamphlet with a suited man walking his daughter and son home from school. Having no family whatsoever, I decided to read on. What I saw dismayed me. Children, the pamphlet proclaimed, where under a huge threat. A new disease was being spread through our schools. The concern: the Safe Schools Program. This pamphlet was from the Marriage Alliance. 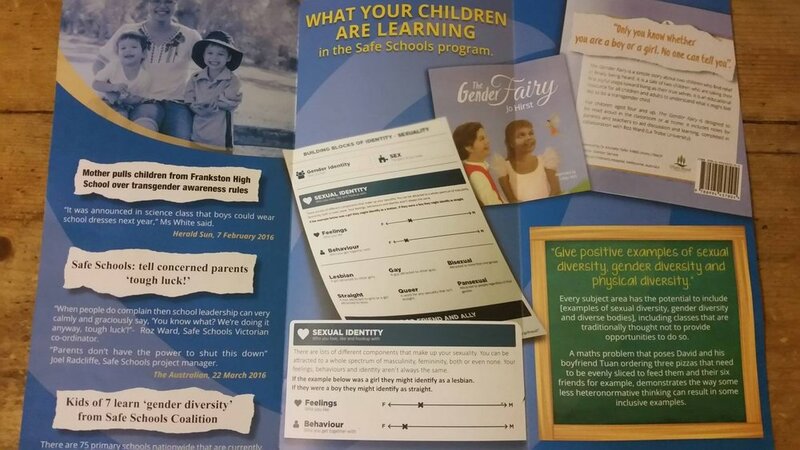 With some choice quotes from news articles, and a few extracts from the safe school hub website, the pamphlet appealed to the conservative within the reader. A story about a boy being told he could wear a dress to school, a chart that allows you to map your sexual identity and a book that holds only you can choose which Gender you identify with were all held out as horror inducing materials to brainwash your children into becoming Gender fluid beings. It ended with his message ‘Changing the marriage laws will impact your family’. It’s this kind of ridiculous insular thinking that shows exactly how much every person needs the education proposed by safe schools. It is trite to say that understanding your sexuality, gender and the fact that society can include LGBTIQ people is incredibly important. Clearly a better educated society has amazing effects for LGBTIQ people. But even those who don't identify as LGBTIQ can benefit. You can be a better person. I hate the fact that my own infelicities cause my friends so much angst, and can contribute to people feeling somehow like the other. It’s very hard as someone who likes to think of myself as inclusive that my very thoughts and language can do so much harm. History has shown that this kind of inclusive education is not dangerous. I just wish that I had been taught the important lessons told through safe schools. Oct 30 Spoiler Nation podcast: Visual flares reinvigorate usual Marvel fanfare in "Doctor Strange"